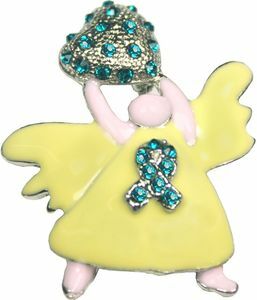 Ovarian Cancer Angel Awareness Rhinestone Brooch: This classy teal heavyweight Ovarian Cancer Angel Brooch is holding a heart and wearing a teal ribbon on her chest. This ovarian cancer teal angel brooch is plated in silver and includes a locking brooch pin back. A great gift to show support for ovarian cancer.